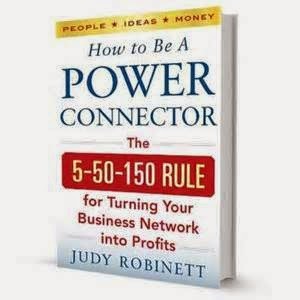 After the third time my business partner, MeredithBell, raved about Judy Robinett’s book, How to Be a Power Connector (McGraw-Hill, 2014), I decided I should read it. Meredith is almost never wrong about these things. The book arrived the day before I left to go SCUBA diving in Bonaire with friends, so I brought it with me to read on the plane. By the time I'd returned, I'd read it cover-to-cover, very slowly, twice, meticulously underlining hundreds of need-to-remember passages. This is the most important success/professional development book I've read in decades. For me it’s a game-changer. It has caused me to rethink how I approach my business and how I work as a writer. An exceedingly well-structured and well-written book, it skillfully blends the idea of strategic, purposeful networking with the central imperative to generously add value, giving over and over without expecting anything in return. How to put practical limits on your networking activities: the 5+50+100 rule. How to evaluate your professional relationships. How to organize a system to keep track of these relationships. How to “ask” for what you need. How to follow up after making contact. How to “work a room” at a public gathering. How to use social media to nurture your network. How to identify people you don’t want in your network. How to assess your own value as a network resource. How to approach a new contact. And a lot more. I especially liked her insights about the differences between male and female networkers. The book has so much how-to “meat” about this vital subject that for me, it’s more than a how-to book. It’s a reference book. It won't live in my bookcase. It will live on my desk. Before I adopt a tracking system, before I attend another conference, before I approach another high-profile influencer, I'll reread the relevant chapters. No wonder Inc. Magazine named it the No. 1 Business Book of 2014. I honestly feel that anyone who is trying to succeed in business and who hasn't read the book is at a serious disadvantage. My advice: get your hands on a copy and read it at your earliest convenience.